PepPod showcased its unique energy tablets that contain vitamins, electrolytes, amino acids and 75-plus trace minerals designed to provide healthy, sustainable energy at January’s ECRM® EPPS event in Washington, D.C.
PepPods do not contain sugar or gluten, are vegetarian friendly and non-GMO. It comes in citrus and berry flavors, and can also be purchased in tubes or boxes of 20-count single packs. PepPod is exciting to retailers because each tablet provides amino acids, antioxidants, electrolytes, vitamins and more than 75 trace minerals — and they’re actually good for you. They’re small enough to keep single packs or tubes of 10 right by the cash register for people on the go. The Vitamin, Weight Management and Sports Nutrition Efficient Program Planning Sessions (EPPS) is a trade show where vitamin and nutrition companies like PepPod go to network with major retail buyers in private sessions. 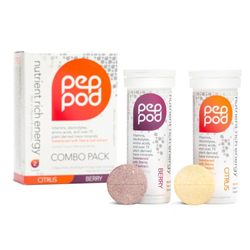 ECRM® events can help grow the brand recognition of PepPod, giving retailers a chance to learn about its effervescent, nutrient-rich energy pods that dissolve in a beverage of choice. “ECRM® will help get PepPod onto more store shelves so people outside our distribution area here in Colorado can access them without having to go online,” PepPod CEO Jennifer Pearce said. “We are excited to take these crucial steps in growing our brand and making it more accessible to shoppers at various chains across America. EPPS is a branch of the Efficient Collaborative Retail Marketing (ECRM®) event series held Jan. 7-11 at the Hilton Washington in Washington, D.C. Brands were able to have direct discussions with retailers and other brands about business objectives like product launches, marketing campaigns and more. Some of the major retailers include Amazon.com, Costco, CVS, GNC, Harris Teeter, LuckyVitamin.com, Meijer, Sam’s Club, The Fresh Market, Vitamin Shoppe, Walgreens, Whole Foods and more. The minerals in PepPod are cold-water extracted from an undisturbed prehistoric plant deposit — making them all natural and healthy — found only in Utah. These minerals are perfectly preserved and safe from erosion and farming, leaving them rich in plant-based minerals. For more information on PepPod’s 20-count boxes, which are currently available in a special buy-1-get-1-free promotion, go to http://www.peppod.com.